It has been a month since I updated my blog! No, I have not decided to discontinue with the blog or have been plain lazy to update! 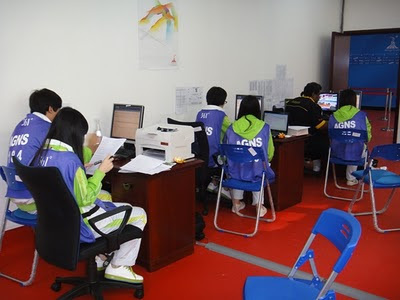 The truth of the matter was that I in Gunagzhou, China working for the 16th Asian Games New Services with Xinhua News Agency and I cannot access my blog from China! A lot has happened in the last one month which I had wanted very much to write on, but simply could not. I lost a dear friend, K. Prabaharan during this period on Nov 17 and wanted so much to write and share my experience with him which spanned over 30 years. It is sad that he had to go at such a young age of 54 because of the cancer. I still cannot bring myself to belief that he has gone. I will find some time soon and share my thought on Praba, who was a true sportsman, an excellent physiotherapist, one who worked his way up in life through great hardship,. a true friend to many and yet still many did not have nice things to say about...it was really sad. He was the older brother to me that I did not have! I will write in length soon. As for Gunagzhou, it was an experience of a lifetime. 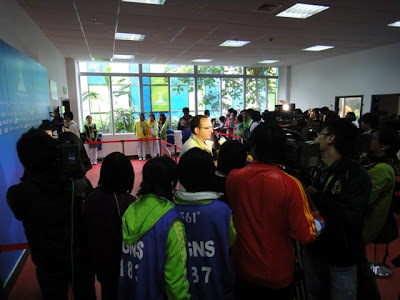 This is my fourth Asian Games since I first covered the 1994 Hiroshima Asian Games, and it was definitely the back. 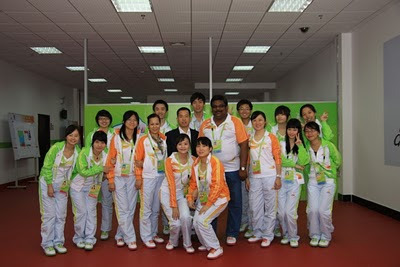 After my bitter experience at the New Delhi 2010 Asian Games, I had gone to Gunagzhou with a very open mind. And it was a pleasant surprise all the way. It is a beautiful city and they do not call Gunagzhou the Amsterdam of the East for nothing. The Games was managed excellently and it was difficult to find one single flaw. Indeed, congratulations to Guangzhou for organising such and excellent Game which has raised the benchmark by hundredth folds for the next host Incheon in 2014. Right now, I am in Muscat, Oman for the 2nd Asian Beach Games which starts on Dec 8 and ends on Dec 16. I am here as the Media Officer with the Olympic Council of Malaysia secretariat staff to assist the Chef-de-Mission, Datuk James Selvaraj and the small contingent of 15 athletes and 4 officials who will compete in bodybuilding, sailing, windsurfing and water ski. I will definitely be updating my blog to catch up on the one month I have missed. Kindly also view my second blog: http://blog.thebowlingmag.com/ or check out www.thebowlingmag.com for latest updates on bowling. A three day Olympism Outreach Program was held in the Senior Methodist Girls School KL (MGSKL) for Form 4 students as an after exams activity by the Pierre de Coubertin Society of Malaysia (PCSM) in partnership with Pilot Pen Malaysia Sdn. Bhd from November 1-3, 2010 in the school itself. A total of 105 students from four classes were involved in the program which was held during school hours. The program was filled with lectures, group discussions, presentations, games and even a cultural performance on the last day. 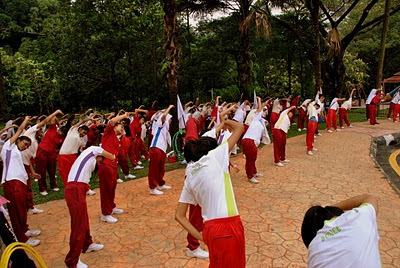 These activities were designed to introduce students to Olympic Education which focuses on positive values like fairplay, respect, excellence and teamwork by using sports in particular the Olympic Games and sporting personalities as examples. The program received positive feedback from the participating students. They expressed that it was very enjoyable and they learned how to work as a team and the activities encouraged them to interact and communicate more. Some even said that they managed to make new friends. Unanimously, they all agreed that the program should be held every year and the knowledge be shared with other forms as well. 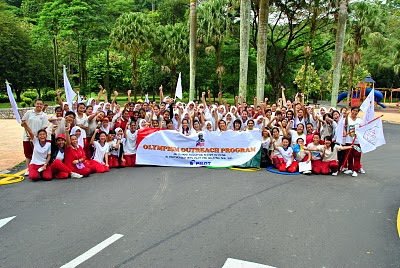 Accolades about the program were also received by the Principle of MGSKL, Pn. Phoon Yoke Meng. She too agreed that the program was very beneficial to her students as it encouraged them to think out of the box, build confidence and promote values which are important to mould them into better human beings. She recommends that this program be organized in other schools as well and would like the program to be held again next year in MGSKL. The closing ceremony was attended by Mr. MP Haridas, President of the Gymnastics Association of Kuala Lumpur who also is the advisor to PCSM and Ms. Tay Choon Neo, Deputy Executive Director of the Methodist Council of Education. This is the first time that the Olympic Outreach Program was held in a school. 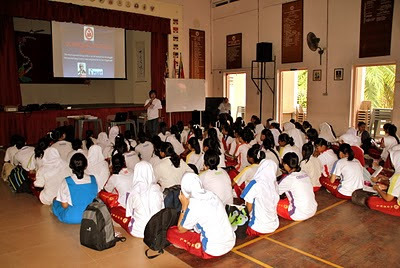 Before this, the program was organized in Sunway College and Universiti Kebangsaan Malaysia for undergraduates. 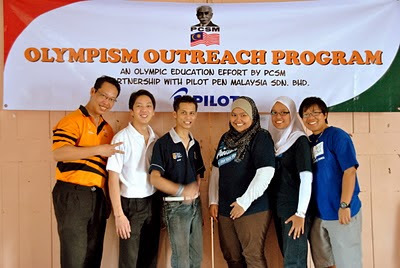 Up to now, PCSM has managed to light the Olympism flame in the lives of over 170 youths. It was a rare occasion this evening when the stalwarts of Klang Valley had gathered in one place - at the cremation ceremony of Dato' Thanapalan Paul Murugasu this evening to pay their last respects. I am talking about former FA of Selangor secretary, S. Anthonysamy (1980 - 1987) and treasurer R. Ramalingam (1971-1986) and former Kuala Lumpur FA secretary, Datuk K. Rasalingam (1975 to early 2000) who was also the FA of Selangor secretary from 1973-1975. The late Dato' Paul Muragasu also was with the FA of Selangor as secretary from 1960-1962 and then again from 1971 to 1972. As a sports journalist with The Malay Mail from the 80s, I have worked closely with all the officials when coverage of the Selangor and Kuala Lumpur league was huge. Not to mention, it was the glorious days of Malaysian soccer and many would say that if a player can earn a place in the Selangor team, he was good enough for the national team. Yes, indeed was glorious days and these officials were part and parcel of that organisation that made Malaysian soccer tick. Another respected sports official, C. Ayathurya, the then Government Services Club secretary, who was also at the ceremony, when he saw the three officials sitting together he commented: "The three pillars of Malaysian soccer are here. But what has happened to those glorious years. What has happened to Malaysian soccer these years." The only respond from the three officials was smiles! Anthonysamy, Ramalingam and Rasalingam had their fair share of criticisms against them from the media and critics, but what they achieved those days is still something to talk about till today. They did not have the kind of funds to manage the associations like they have today, but they ran their associations efficiently and delivered results. There were well organised and highly competitive leagues right up to the district levels and new talent surfaced every season. The younger generation may not know them, but these officials were a rare breed! 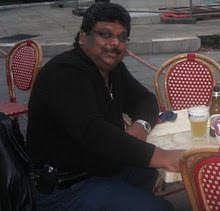 I had a call earlier this evening from a sports journalist asking details of Dato' Paul Murugasu's funeral as he had to write an obituary. This is what he had to ask: "That fellow who passed away, who was the secretary of FA of Malaysia, can you give me details of his death....."
That fellow...Dato Paul Murugasu, was a highly respected man in the Malaysian soccer circle and a distinguished gentleman......if this is the way our young generation is going to show respect to our elders and who have served the sports well, I really feel sorry for the future of our Malaysian sports. 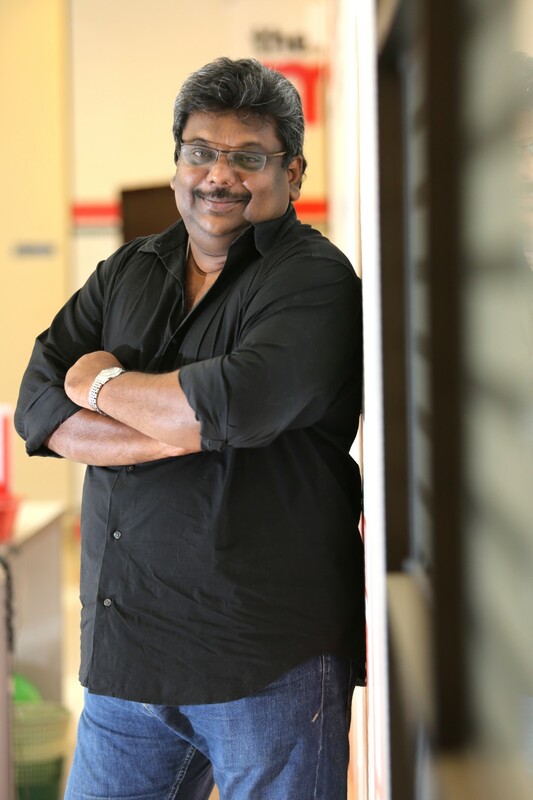 Respect is earned and Dato Paul Murugasu fully earned and deserved it! Rest in peace Dato'Paul Murugasu and to those officials who have done Malaysian soccer proud, we salute you! Dato' Thanapalan Paul Murugasu, the FA of Malaysia secretary from 1980 to 1985 passed away this morning (Monday). Dato' Paul Murugasu, has been ill for sometime now and was 86 years-old. In 2007,Dato' Paul Murugasu was given recognition as a sports administrator when he was inducted into the Olympic Council of Malaysia Hall of fame together five other administrators. Paul took over as secretary-general FA of Malaysia from Datuk Kwok Kin Keng (1951-1980) and Datuk Paul Mony Samuel took over from Paul Murugasu. During the tenure of Dato' Paul Murugasu football was going through its glory days and was enjoyed by almost everyone in Malaysia. Datuk Paul was born on 8 September 1924 in Kuala Lipis in Pahang. 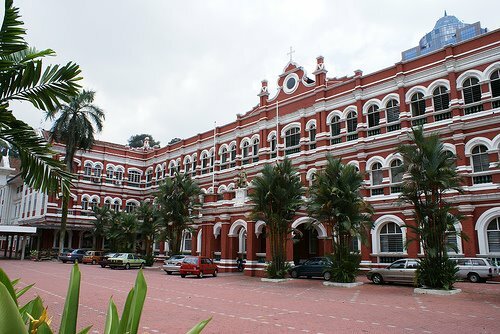 He had his primary education in Kampar, Perak and completed his Senior Cambridge at Anglo Chinese School in Ipoh. He worked as a teacher from 1948 to 1959, beginning at Trade School in Kuala Lumpur and later at the Kajang High School before moving to the Pasar Road English School. 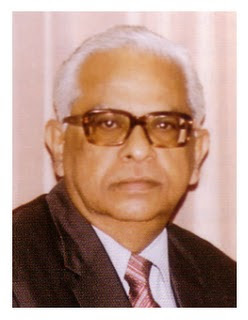 He joined the Election Commission in 1959 and served as the State Election Officer in Kota Bahru (1961-1965), Seremban (1965-1970) and Kuala Lumpur from 1970 until his retirement in 1974. Datuk Paul joined FAM in 1973. He served his “apprenticeship” with the dynamic Datuk Kwok Kin Keng in FAM taking over in 1980. He held the post for seven years and served under two presidents – Tan Sri Dato’ Setia Raja Haji Hamzah bin Abu Samah and HRH Sultan Haji Ahmad Shah. Also check out on the Special Edition of The Bowling Mag on the championship with a preview, stories on personalities and icons, past champions and records, the history of the venue and about Toulon. 93 countries are competing in the bowling history’s oldest championship and an interesting battle in on the cards. Keep a date here for the latest on the 46th QubicaAMF Bowling World Cup, which began with the official practice on Sunday and ends on Saturday with the final. 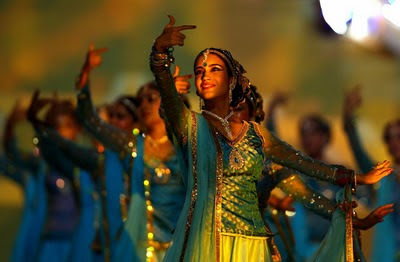 If India's rich and diverse culture was at a grand display at the opening ceremony, a magnificent, energetic and youthful ceremony awaited the audience at the closing show of the 2010 Commonwealth Games in Delhi on Thursday. The closing ceremony stressed on con-temporariness and celebration, an indication to the rising India. Almost 7,000 artistes, domestic and international, mesmerised all eyes with their talent, as the world beyond the stadium watched with joy and disbelief. "Unity and solidarity" were the theme for the nineteenth Commonwealth Closing Ceremony. The organization committee had promised nothing but the best. 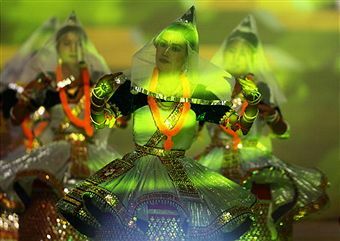 The entertainment segment of the ceremony was designed to highlight India's rich cultural heritage and the depth it enjoys in fields such as dances and martial arts. 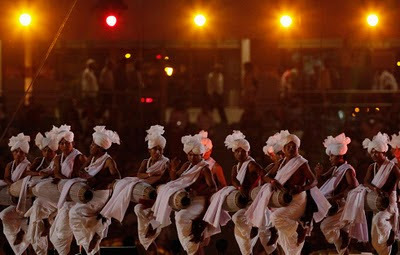 The opening event was an Indian martial arts ceremony titled "Agni" in which 800 performers from Kerala, Tamil Nadu, Manipur, Gujarat, Punjab, Maharashtra and Nagaland displayed their skills in an eight-minute act. 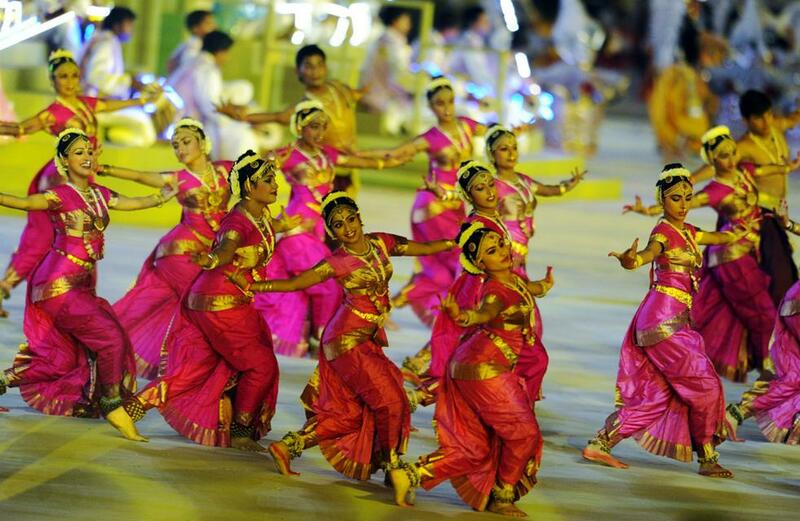 The artistes performed their dare-devil skills as they showcased various martial arts forms of India with the Sanskrit verses reverberating the air. 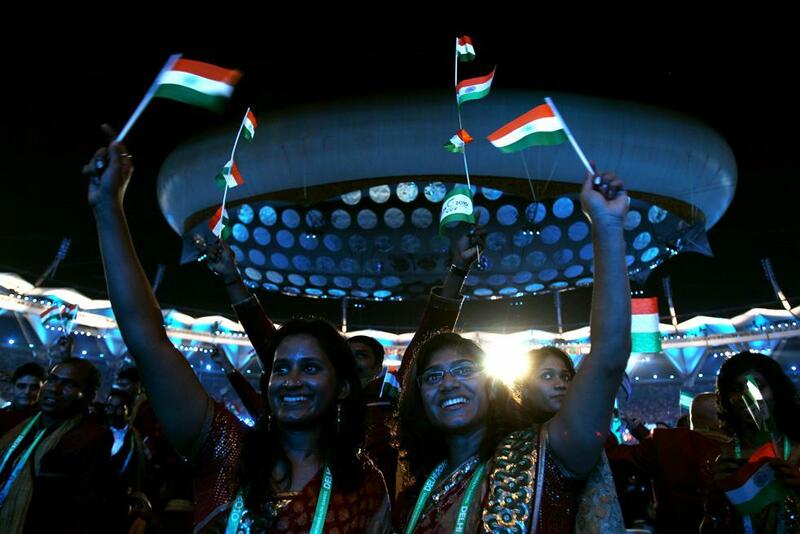 Vande Mataram added patriotic fervor to the ceremony. 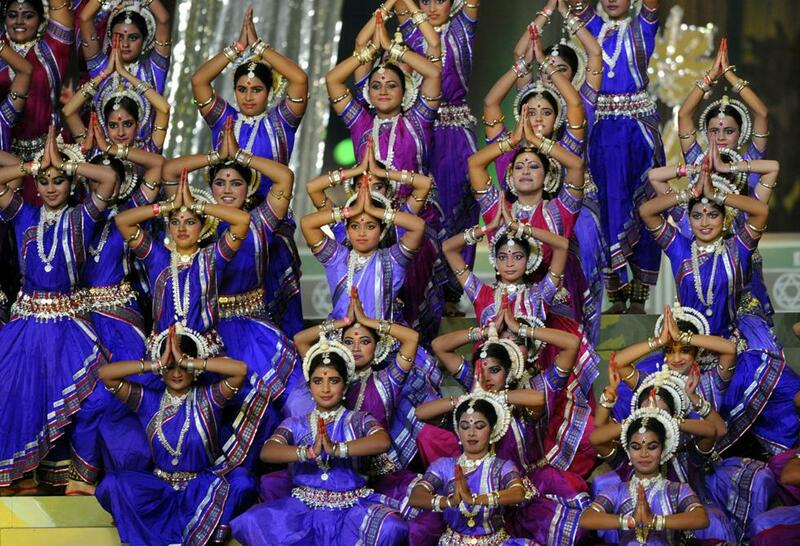 Paying tribute to the country, over 2,000 schoolchildren performed to the tunes of Oscar winner A.R. Rahman's composition Vande Mataram. Rahman was not present at the ceremony. This segment was followed by a 10-minute performance by the Armed forces' band, which annually performs at the Beating Retreat ceremony during the Republic Day celebrations. The Army Forces' band received loud applause as it performed 'Saare Jahaan Se Acha' , Kadam Kadam Badhaye ja....and other melodious tunes. Then it was the turn of the athletes' march past. The contingents came in alphabetical order, carrying their national flags with joy and waiving to the applauding crowd in the stadium. The Indian contingent received a huge applaud, as all the players, having done India proud in the Games winning 38 Gold, 27 Silver, and 36 Bronze in the overall medal tally of 101 medals. Shooter Gagan Narang, who won four Gold medals for India, was the flag-bearer, as the rest of the contingent followed him and it was greeted by all sitting in the audience. Rahman's composed Jiyo Utho Badho comprised different shots reminding everyone of the various moments of joy and despair as lived be athletes in these games. Singer Shaan escorted Delhi Commonwealth Games' muscot Shera in a decorated three-wheeler and took a round of the track. The audience joined Shaan in bidding Shera a musical farewell. 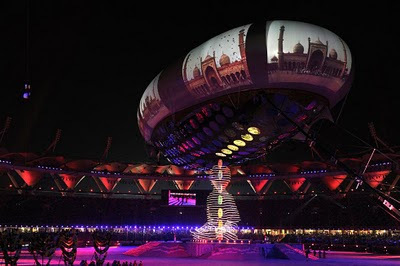 At the ceremony, Organising Committee's Chief Suresh Kalmadi was once again hooted, as he began to read out his speech. He said, "it's been a life changing experience." Prime Minister Dr. Manmohan Singh, accompanied by his wife Gursharan Kaur was present at the ceremony to grace the occasion. Sri Lankan President Mahinda Rajapaksa, who was Guest of the honour at the closing ceremony, was sitting next to the Prime Minister Dr. Singh. Vice President Hamid Ansari, Lok Sabha Speaker Meira Kumar, Union Sport Minister K.P.S.Gill, Urban Development Minister S. Jaipal Reddy, Information and Broadcasting Minister Ambika Soni, and senior BJP leader L.K.Advani were among other distinguish personalities present on this occasion. Congress General Secretary Rahul Gandhi was sitting beside Minister of State for Petroleum and Natural Gas Jitin Prasad at the stadium among the audience instead of the VVIP block. Delhi's Lt. Governor Tejender Khanna was also present on this occasion. The mention of Delhi Chief Minister Sheila Dikshit was again greeted with a great roar in her admiration. Michael Fennell, the Commonwealth Games Federation President, was also present on this occasion. During his speech, he thanked Delhi and all here for organising an "outstanding" Games. "Delhi you have truly exceptional games, and given us a wonder experience to us all," Fennell said in his speech. 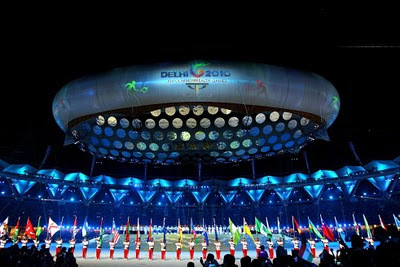 He said the spectators and people of Delhi have been simply "great" and appreciated them for attending all events. After the speeches and other protocol-related events, the Commonwealth Games flag was handed over by Delhi's Lt. Governor Tejender Khanna to Scotland, the hosts of the 2014 Games in Glasgow. The flag will now be taken off to begin a new journey towards Glasgow city where the 2014 CWG events will take place. 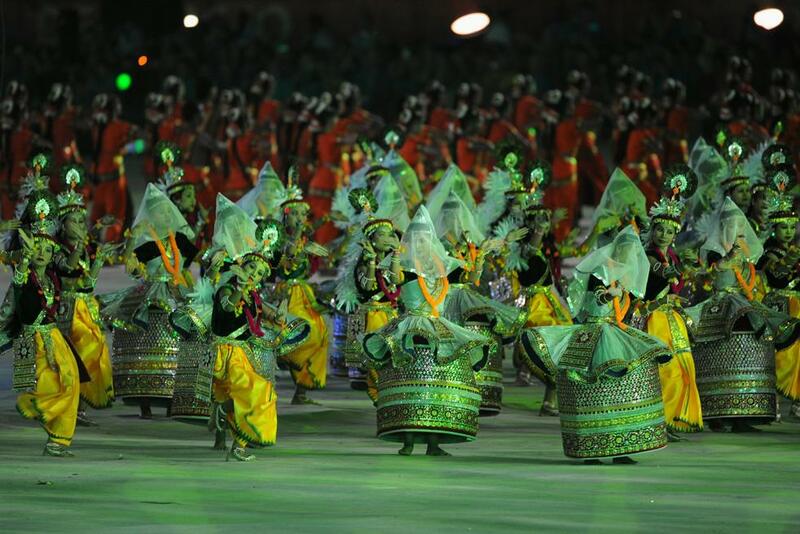 Over 400 Scottish performers, on this occasion, formed various designs and also created their national flag in their 10- minute besides giving a splendid dance performance. The final word for the closure of XIX Commonwealth Games Delhi 2010 came from Prince Edward, said, "On behalf of Her Majesty Queen Elizabeth, head of the Commonwealth,and in the name of Commonwealth Games federation, I proclaim the XIX Commonwealth Games Delhi 2010 closed." Meanwhile, the aerostat that beamed numerous colourful images at the opening ceremony, donned a new festive look, ahead of Diwali, with elaborate decorations at the closing ceremony of the Games. Earlier, a high-tech laser show by the Germany-based firm Tarm Laser Technologies was a feast for the eyes of everyone present inside the Jawaharlal Nehru stadium. It showcased a splendid array of lights and special effects such as sea waves and graphics with beams to light up the sky. Bollywood won hearts at the stadium. 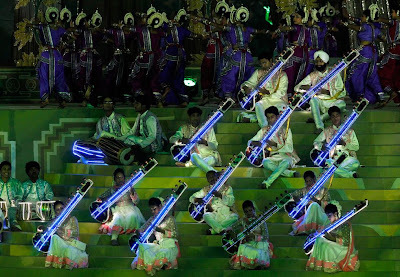 During the 30-minute segment 'Music of Universal Love' popular songs from four genres-Folk, Sufi, Indi-pop and world music-featured in the closing ceremony. This photograph of policewoman Bibiana Ng being hosited by supporters after she won the gold medal in the 10m air pistol event at the Dr Karni Singh Shooting Range appeared in the NST back page. Notice Bibiana wearing the sponsored Bata track shoes. Today James was all smiles. This is the kind of mileage sponsors seek for millions spent on sponsorship. Image Bibiana wearing a show of her choice or comfort - what kind of mileage would Bata have lost. Indeed, Bibiana is dream client for any sponsor. Bata also needs to thank NST for having used that particular picture and also played it up on their back page. Sometimes, sponsors depend on luck for their product to be displayed because there could be many winners on a particular day and a picture has to be interesting or capture the interest of the readers before it is used. Of course the photographer played a key role to capture the right moment. Thus, with so many factors involved before a sponsor gets some exposure in the media, it is little surprise when they get upset when sponsored goods are not used by officials and athletes. For today, Bata's sponsorship of the Commonwealth Games contingent is virtually covered and James can rest easy when it comes to justifying to his bosses. A thank-you is in line from Bata to Bibiana!....maybe more Bata shoes! New Delhi: For more than a month, 1500 people from the Army have worked overtime for the Commonwealth Games. Their to-do list has included managing venues used for the games, handling protocol requirements with the international contingents in town, and stepping in to rebuild a crucial bridge in record time after it collapsed days before the Games began. For all this, the Army is not being compensated. The organisers of the Games reneged on a promise to cover basic expenses like transport and cellphones for the jawans and officers enlisted for the event. The bill of 11 crores, the Defence Minister was told recently, would have to be covered by the defence budget because the organisers had run out of money. 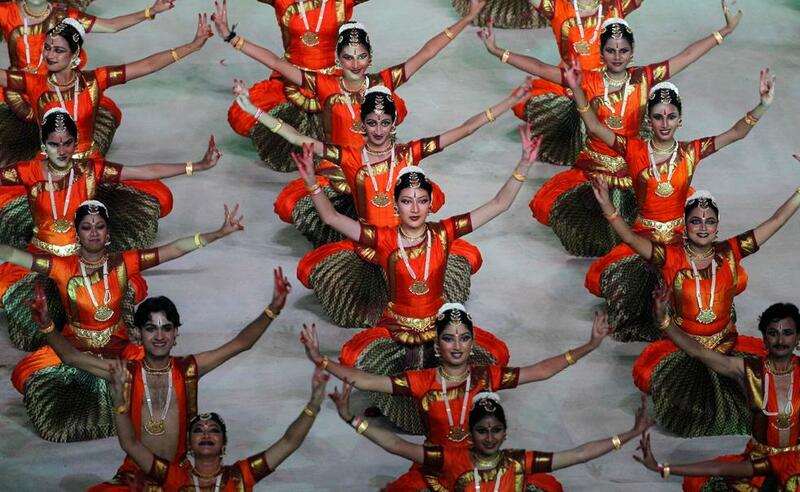 During the Games so far, the Army has contributed 23 medals, including eight golds, for India. Earlier this month, it booked 300 tickets for Thursday's closing ceremony; last week, it deposited four lakhs for the same tickets. But now, they've been told the closing ceremony is off-limits. 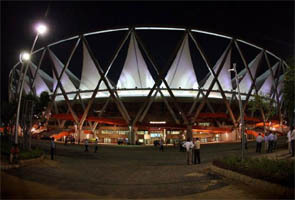 The Organising Committee, headed by Suresh Kalmadi, has said it has run out of tickets. "The armed forces have played a major role in the CWG. If they face any problems, I will look into it," said Kalmadi. 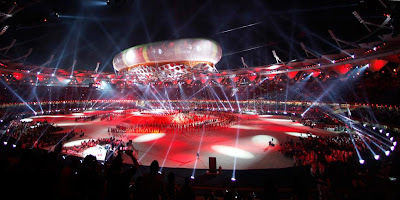 One of the lowlights of the Games has been the skimpy audiences - sportspersons performed in near-empty stadia, a fact brought up repeatedly by the international officials of the Commonwealth Games Federation. Yet, tickets are not available for most events - complimentary passes seem to be the only entry point to venues. Sponsor takes Malaysian CWG athletes and officials to task! Malaysian athletes and officials professionalism when representing the nation has been questioned this time around by a sponsor - Bata. Bata sponsors to a tune of RM 1 million for national athletes and officials at the Sea, Asian, Commonwealth and Olympic Games. 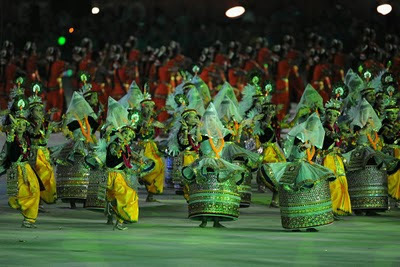 They provide leather shoes for the march-past of the opening ceremony and specially designed sports shoes to be used when they are out of competition eg Games Village or travelling. Datuk James Selvaraj, the Senior Manager of Bata Marketing Sdn Bhd said that the contract of the sponsorship clearly stipulates that athletes and officials must use the leather shoes for the march past and training shoes at times when they are out of competition. "But this arrangement has not been met most of the time and it was clearly evident in ongoing New Delhi Commonwealth Games," James told this scribe. James said that the officials themselves have not adhered to the requirements. It is little wonder that sponsors these days shun away from getting involved in sports sponsorship because more often than not, their obligations through the sponsorship are not fullfilled. Sponsors spend millions of ringgit on sponsorship basically to get mileage through their branding besides tax exemptions. This is where our officials and athletes have to act professionally and not just collect sponsorship goods and then not use it. Bata's sponsorship is through the Olympic Council of Malaysia and the latter certainly needs to enforce stricter monitoring of sponsored goods being utilised as stipulated by the contract. Of course athletes and associations have their own sponsors and obligations to meet. But when going for a Games, it is the OCM who takes charges and they too have their obligations to meet. Like Bata, most of the sponsors are flexible as long as their products are used during stipulated times. But if their sponsored goods are not used at all, the sponsors certainly have a case and reason to be upset. It all boils down to professionalism. 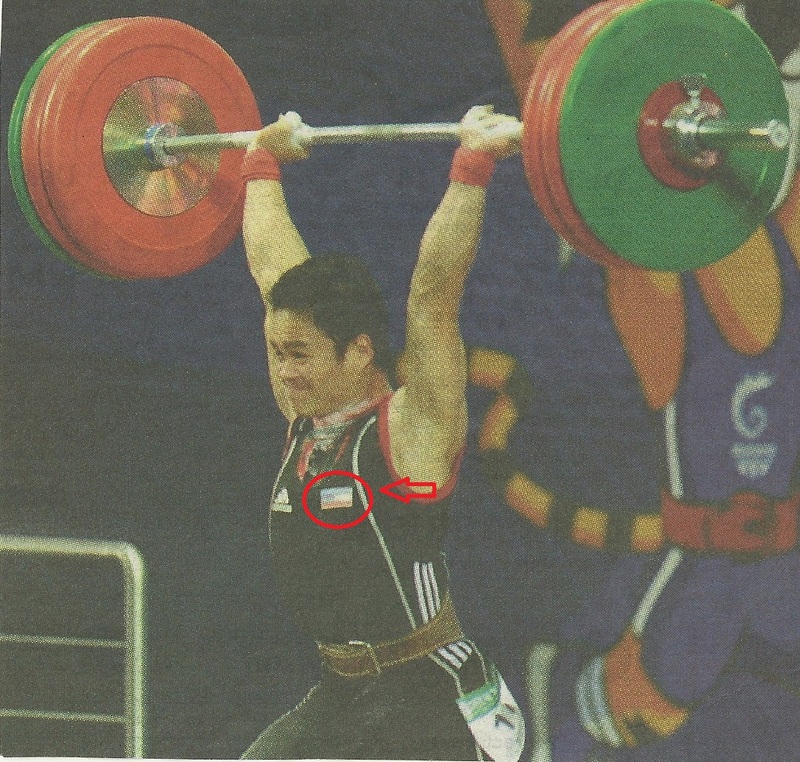 Just like in the case of weightlifter Aricco Jumitih's attire bore the Sabah flag instead of the Malaysian flag and had the words Sabah written behind his attire instead of MALAYSIA! It is official, athletes representing the nation can wear whatever is comfortable to them. The Youth and Sports Minister, Datuk Ahmad Shabery Cheek, himself, has come in defence on issues of attire at the New Delhi Commonwealth Games. Maybe in time to come we will see an athlete competing in "birthday suit" because it is comfortable to him or her! And the dear Minister, has actually missed the point. It is not about comfortable attire which was raised by observers and critics , but the Sabah flag that was on weightlifter Aricco Jumitih's attire when he competed instead of the Malaysian flag! I had already raised about athletes' using their own attire because it is comfortable in my posting earlier and even had predicted that this will be excuse given. But is it so difficult to sew on a Malaysian flag on that "comfortable attire" when representing MALAYSIA! Did the officials and athletes not have all the time in the world before the Games to look into all these matters? Will the the Sports Minister throw in his support if each athlete representing the nation displays their respective State flags? And no one is taking the athlete to task (although he too has a responsibility too), but the many officials who are present in New Delhi, who are administrators and suppose to look into matters like these. So much for patriotism to the nation! Officials have goofed and they are answerable. Period. Read the Bernama report below and see what the Honourable Sports Minister's stand is on the issue! KUALA TERENGGANU, Oct 11 (Bernama) -- Youth and Sports Minister Datuk Ahmad Shabery Cheek Monday chided those who raised baseless criticism on issues like attire of athletes at the New Delhi Commonwealth Games. 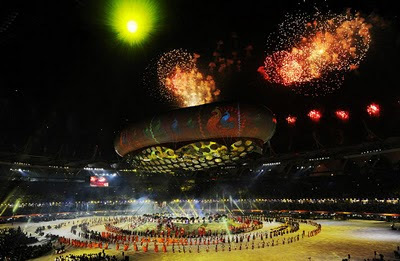 He said the ministry had received negative comments and complaints related to attire of athletes in New Delhi, including the attire worn by the Malaysian contingent during the opening ceremony of the New Delhi Commonwealth Games. Ahmad Shabery said the latest criticism was the attire worn by weightlifter Aricco Jumitih when competing and winning the gold medal in the 62kg category, since the Sabah athlete was wearing the Sabah state attire which did not reflect the country's image at an international event. He said such criticism was negative and athletes should not be blamed or crucified based on their attire. "I was made to understand that weightlifting is a very sensitive sport which involves various sensitive elements like food, attire and environment. Sometimes if an athlete is not comfortable with another attire, he may not be able to perform well. "Maybe what he was wearing was the most comfortable attire for Arrico during the competition and he proved it right by winning the gold medal. What is the point of wearing the 'right' attire and losing compared with winning with an alternative attire," he told reporters here Monday. However, the ministry would work towards rectifying any flaws during the games, if such events are deemed detrimental. 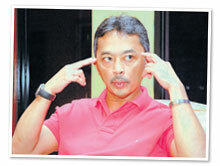 Speaking of Malaysia's 10-gold target, Ahmad Shabery said he was confident that the target would be achieved. "It is not impossible to achieve the target and I am confident the athletes will work towards that goal," he said. Ulu Klang Recreation Club (UKRC) is just a small community club who are still battling to keep the land which rightly belongs to them, but bureaucracy red-tape and hidden hands has seen them go on a long drawn battle. But that has not eroded the confidence of its club principal officers headed by president Andrew Gopal, as they still continue go about their daily routine to serve the local community with the much needed recreational facilities and a venue for social gathering. For those familiar with UKRC, they will find that its humble settings and unpretentious existence since 1957, had not stopped members and the local community from making it a one-stop recreation centre for the whole family. And one of the activities UKRC carry out is their International Soccer 9s annually which serves as a fund raising event to continue to add new facilities to the club. This year it was held over last weekend, where twelve teams competed coming from Australia, Thailand, Singapore, Indonesia and local teams from both East and West Malaysia. The teams were Gold Coast Koalas, Kurnia Medan City FC, Prince Songkla University, Singapore Recreation Club, Black Eagle FC, Penang Sports Club, Chinese Recreation Club, Taiping, The Malacca Club, Melodi Jaya FC, Uniplast FC and host UKRC. Indeed UKRC is unique not only to have gone to host this tournament for the tenth consecutive year despite all the problems they have been facing, but they are special in many ways. Special because of the recognition they get which many top clubs find it difficult. For starters, their tournament is sponsored by the cable television station Astro! For a giant corporation to support a small club, there must be surely something great that Astro sees in UKRC. UKRC also produced a souvenir magazine which all the members had worked hard to bring in the advertisements and indeed they have garnered some good support. And it not all about monetary gains either. UKRC had a rare occasion when several ex-internationals attended their official dinner on Saturday night for competing teams at their club hall. The list went like this : Chow Kwai Lam, Chow Chee Keong, Wong Choon Wah, Santokh Singh, Yip Chee Keong and former Selangor state player Chung Chun Yong. Among the the younger generation of ex-international present included Chen Wooi Hwa and A. Rukumaran. But the sight Chee Keong, the first Malaysian to play professional football in Hong Kong way back in the 70s, was indeed a surprise as he has been missing from the scene. And to see him with Kwai Lam, Choon Wah, Santokh and Yip, brought flashbacks of the golden era Malaysian soccer enjoyed. It was indeed a rare treat for all those present to have seen all these players present in one place. And that is the uniqueness of UKRC. They have the admiration of these legends who find time to be present to grace their function. Amongst Legends...the scribe had this rare opportunity to be photographed with (from left) Chow Chee Keong, Wong Choon Wah, Santokh Singh and Yip Chee Keong. HONOURED.....The legends honoured at the Dinner as they came up to the stage to the thunderous applause of the guests. Also on stage is the organising committee led by Andrew. UKRC also had a rare item on their night's itinerary - UKRC Life Time Achievement Award. UKRC is not one who blow their own trumpets, but they felt it was fitting and timely that they reward some of their loyal members who are pillars of the club and seen it become what it is today. Only on two other occasions has the club honoured their members - the first in 2003 when they honoured their first president, the later K. Supiah and in 2007 when another president, Ten Foong Keong (1996-2001) was honoured. On Saturday night another two awards were given out. The award was to recognise the efforts and contribution made by a member over the years to the club as a volunteer and where the passion and commitment of the member in taking the club to a greater height beyond is valued by club members. The first recipient had spent more than 30 years with the club and is seen in the club 360 days in year - minus 5 days for public holidays. He is regarded like a fatherly figure to the members, well known in the village of Ulu Klang and is 60 years old and still going very strong. Club members say that he loves the club more than his wife! And it was none other Lee Paw Koi more populary known as Uncle Lee who was awarded the award by Andrew. The second receipt has football in his blood. Still kicks around with the UKRC veteran team, although these days he plays for one half only with age catching up. He spends most weekends at the club and has been a member for 20 years. He has been taking charge of the UKRC Junior Football Programme for the last six years and is also the secretary of the club. And he was Jeffrey Lau. Indeed a fitting recognition for the duo who have done so much for the club and the club is their heartbeat. However, every member of UKRC deserves an award in their own right, for this is a unique club run by volunteers who serve the community and has achieved a great deal through sheer resilience. Kudos to you UKRC! Keep up the good work. For the record, Kurnia Medan City FC from Indonesia beat Melodi Jaya FC from Johor by a solitary goal to win the tenth edition of the UKRC-Astro International Soccer 9s. 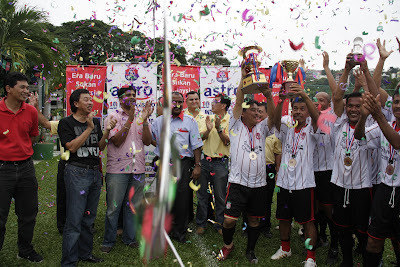 Victory Celebration...Kurnia Medan City FC from Indonesia celebrating after receiving their winning trophy. Also in picture from left....Mohd Fauzi Ahmad, (F and N Beverages), Mohd Kadri Taib (Coca-Cola Far East Limited), Venu Ramadass (Astro Arena) and Andrew Gopal. 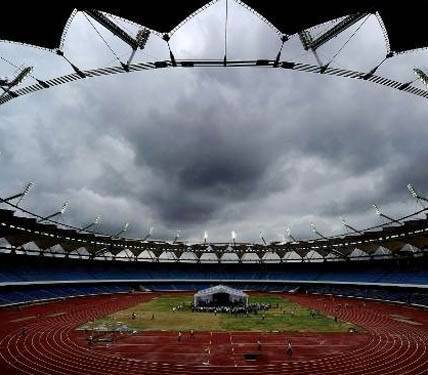 October 4 – Another leading figure has joined the growing band of people pointing the finger at Commonwealth Games Federation (CGF) chief executive Mike Hooper over the disastrous build-up to Delhi 2010. Sieh Kok Chi, secretary general of the Commonwealth Games Association of Malaysia/Olympic Council of Malaysia, told insidethegames that recent criticism of the CGF is completely warranted. He said: "The General Assembly decided not to find fault but to allow the Games to end before carrying out a detailed post mortem on what went wrong. "This was a correct decision as it is important for the athletes that the Games be concluded successfully. "On the other hand, many of the delegates and I strongly believe Mike Hooper should not be permitted to get away with such poor coordination. "Having spent almost three years in Delhi receiving generous expenses, he has nothing to show for it except to blame the Organising Committee. "Frankly, he is only a sports administrator and has no knowledge or experience in project management and coordination. "The most inappropriate thing he said was that he was not an engineer and hence could not do anything. "If he was not an engineer and could not do anything, then he should have stepped down and let someone else who is better take over. New Zealander Hooper has been vocally attacked by his fellow countrymen in recent weeks with Sports Minister Murray McCully stating he cannot simply distance himself from the problems in the build-up to Delhi, having lived in the city for almost three years. He added: "There’s going to be a sharing of responsibility." 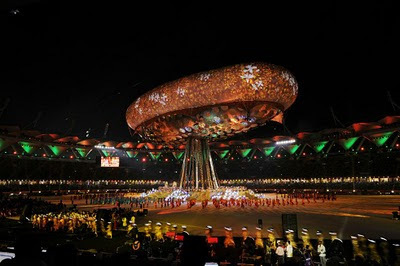 Barry Maister, secretary general of the New Zealand Olympic Committee, and Mike Stanley, President, have also blamed Hooper for the catastrophic events leading up to Delhi, which included photos of a “filthy" Athletes’ Village being broadcast just days before the Games. 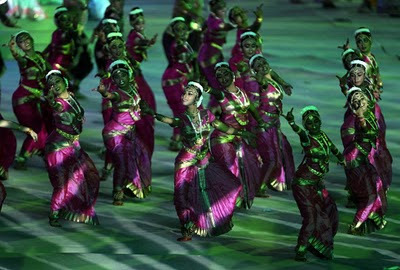 Meanwhile Organising Committee chairman Suresh Kalmadi pointedly omitted Hooper in his speech at the Opening Ceremony. Hooper has continued to lay the blame at the feet of the Organising Committee stating that he gave continual warnings to Kalmadi that progress in organising the Games was well behind schedule. Kudos to international debutant Aricco Jumith for his gold medal winning effort in the Commonwealth Games weightlifting event in New Delhi on Tuesday, but was he representing Malaysia or Sabah. Aricco's attire during the competition bore a Sabah flag! 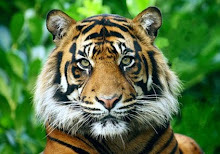 I had a call from New Delhi in the wee hours this morning from an Indian sports journalist asking me when Sabah gained its independence from Malaysia! The picture of Aricco wearing the attire with the Sabah flag appeared in at least one newspaper this morning in Malaysia. This is the picture below taken by AFP. 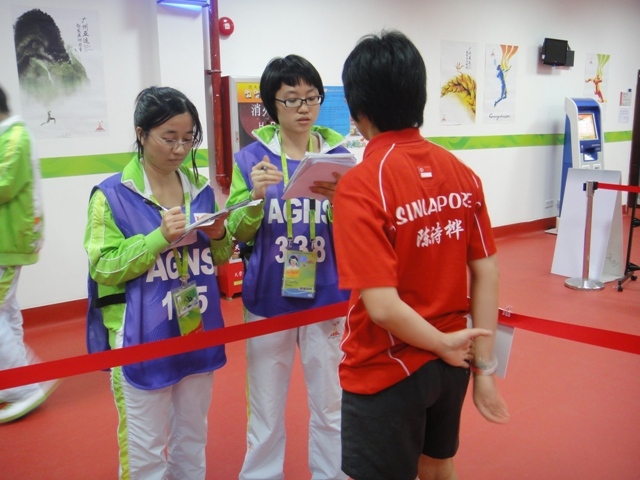 Athletes' attire are supplied by either their national sports association or the National Sports Council (NSC). For multi-sports Games, it is usually NSC who supply the attire. Someone has to give an explanation here why Aricco was wearing an attire bearing the Sabah flag. It has happened before and the usual the explanation would be that the athlete is not comfortable with the official attire or did not have the sizes with the entire supplied by NSC or their national association and prefer to use their own entire. But would sewing on a Malaysian flag on the personal attire be very difficult! I am not against Sabah or the athlete being patriotic towards his State, but when representing the nation, the patriotism should be to the nation. With so many official present in Delhi, especially from NSC, one wonders how they overlooked Arrico's State flag on his attire. Is there an explanation forthcoming? And it is not making mountain out of a mole hill. Agreed Aricco is a Sabahan and is proud to be one, and Sabah is part of Malaysia. But it is the national team competing in an international Games and participants are represented by the nation and not by the state or county of a nation. It all about be professional! Aricco can by all means carry a Sabah and Malaysian flag! But the Malaysian flag has to be displayed...period! There are wise men in the FA of Malaysia executive committee and they should be commended for their decision to have a rethink about readmitting foreign players to the M-League. Reports today said that the FA of Malaysia will only lift the ban on foreign players after it settles several in-house issues, mostly involving affiliates, and the decision should be lauded. "We will conduct a holistic study. Time is not the essence. Our priority is to put our house in order before making changes," the FAM deputy president Tengku Abdullah Sultan Ahmad Shah was quoted as saying after chairing the executive committee meeting at Wisma FAM in Kelana Jaya yesterday. "We don't want to make hasty decisions. Several in-house issues need to be solved first. We want our teams to comply with all conditions before we lift the ban on foreign players. "Right now, some teams have not complied with EPF requirements and other conditions.Yes, we want to raise the standard of our local league but we want to do it constructively," he was quoted in the New Straits Times today. He is also added that the new format will be constructed in accordance with national team's international assignments so as to enable the national team to train more regularly before competitions. At least there are still officials who place emphasis on the national team and are not selfish just thinking of their own teams in their State. Many had tried to bulldoze the re-entry of foreign players and even a seminar was held to champion their cause, but commonsense has prevailed in the end. There is still hope for Malaysian soccer if wise and decisions with long term goals are made. Yesterday was definitely one instance where a decision was taken with the interest of game and not self interest! This in Incredible India for you! 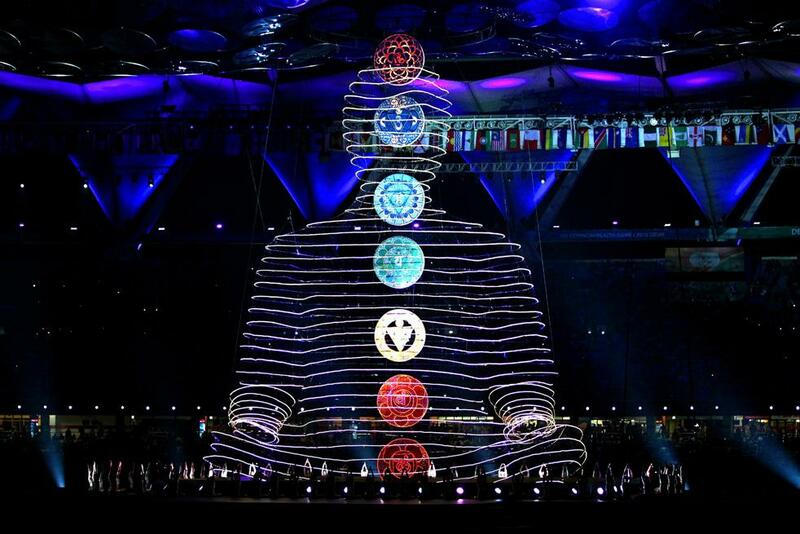 As I sat last night glued to the television for three hours to watch the live opening ceremony of the 19th Delhi Commonwealth Games at the Jawaharlal Nehru stadium in New Delhi, I told myself that I had not expected anything less. Yes, on Aug 26, I had posted, Incredible India will make CWG happen (read here). I had no doubts about it after my experience of how the Indira Gandhi International Airport Terminal 3 became a reality despite so many apprehensions. And as I watched the opening ceremony, I only wished I was there after having been there for three and-half months working with the Organising Committee. Congratulations was indeed in order for a spectacular show which was saw the diversified rich cultural background of India portrayed India in the best possible way. 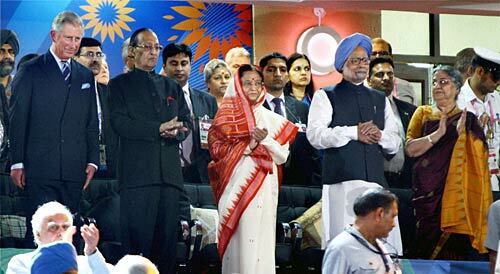 President Pratibha Patil, her husband Devi Singh Shekhawat, Britain's Prince Charles, Prime Minister Manmohan Singh and his wife Gursharan Kaur at the opening ceremony of Commonwealth Games at Jawaharlal Nehru stadium in New Delhi on Sunday. 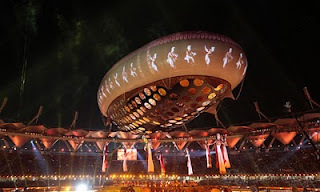 There was so much criticism over the spending on the aerostat - the biggest helium ballon in the world to be used for the first time for an entertainment event -, but in end, it stole the show. 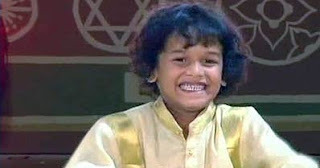 From the time child prodigy, even-year-old Keshav stole the limelight as he mesmerised the spectators, including President Pratibha Patil and Prince Charles, synchronising his tabla with the beat of a variety of drummers numbering over 800, it indicated that the worst was behind India. From Auroville in Puducherry, the child prodigy's performance was part of 'Rythms of India' segment of the ceremony which was tipped as an Indian invocation of the ceremony bringing together folk drums of the country. 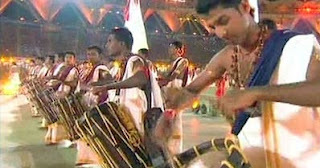 Beats of a variety of 800 drums -- from Pung Cholom of Manipur to Chenda of Kerala to Gudum Baja -- reverberated the stadium as spectators were left spell-bound. The 1,000 children from various schools in the national capital performing a choreography, creating a formation of 'Namaste' (folded hands) - the sign of welcome and respect to the honoured guests from all over the world - was a true picture how down to earth the Indians are. The students' painting images of hands with 'mehandi' on a giant cloth was simply amazing. As the students attired in tricolour choreographed the Namaste sign, the aerostat welcomed the guests from abroad and various parts of the country in 23 different languages. Then on, there were no looking back. Never mind that a staggering US$6 million (RM18 billion) was spent for the Games to happen. The stage has been set for the Games to begin and they now have to live up to the spectacular opening ceremony for the next 10 days of competition. 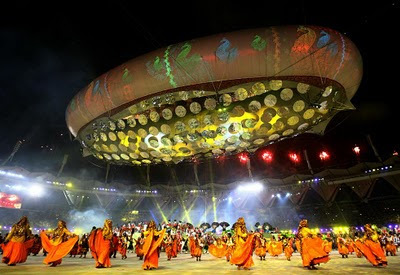 A record 6,800 athletes from 71 countries will be competing and now that the opening ceremony is out of the way passing with flying colours, they now have to ensure mechanics of the Games will go on as smoothly too. It must be mentioned here too, that for once the athletes at a Games were actually seated after their marched into the Stadium and were part of the celebration and enjoyed the show, unless in most Games where the athletes are not there to enjoy the show put up or have to stand through long hours to watch the opening ceremony. Kudos India for taking the interest of the athletes and official to heart! After all, the Games is all about the athletes. As the competitions get underway, there are bound to be hiccups with a Games of such magnitude, but to silence the critics once and for all, the organisers have to minimise hitches and put their best foot forward before we wait for an even more breathtaking closing ceremony come Oct 14. 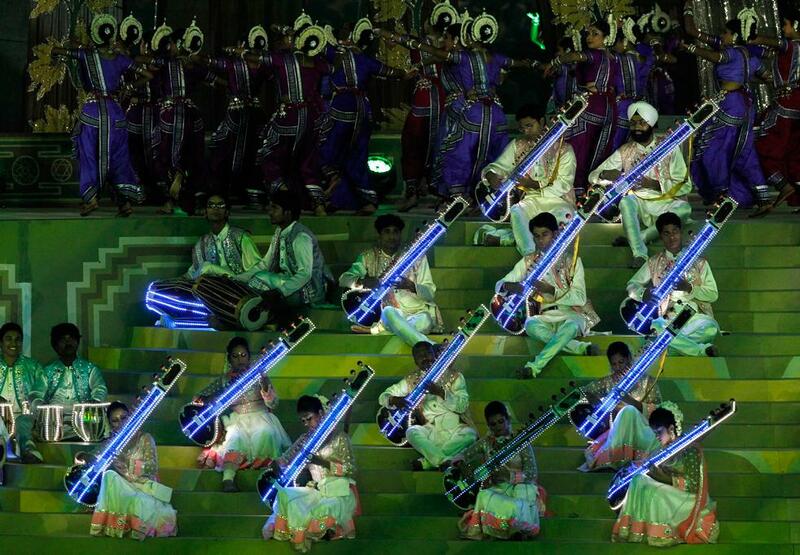 New Delhi: About 7,000 men, women and children will dish out a show of India's cultural heritage in a gala Commonwealth Games opening ceremony with the icing on the cake being Maestro A R Rahman's performance at the Jawaharlal Nehru Stadium on Sunday. 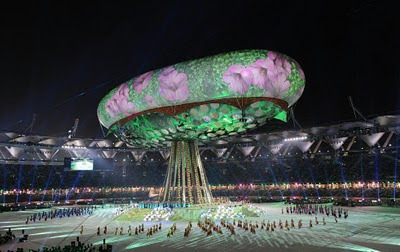 With most of the tickets already sold out, the two-hour ceremony, scheduled from 7 p m, will start with President Pratibha Patil and Britain's Prince Charles expected to declare the Games open in front of a packed stadium of 65,000 capacity tomorrow. The 619-member strong Indian contingent will be led by Olympic gold medalist Abhinav Bindra who will carry the Indian flag during the ceremony. Even as tennis sensation Sania Mirza will not be part of the Indian march-past as the Hyederabadi ace has preferred to rest, badminton star Saina Nehwal, Beijing Olympic Games bronze medalist boxer Vijender Kumar and wrestler Sushil Kumar will be among the six who will carry the baton during the formal part of the pageant. There will be seven segments -- including Rhythm of India, Swagatam, Tree of Knowledge, Yoga, Great Indian Journey and Oscar winner composer A.R. Rahman's rendition of the CWG anthem 'Jiyo Utho Badho Jeeto' -- in the nearly three-hour ceremony. The guest panel will include International Olympic Committee president Jacques Rogge, Commonwealth Games Federation chief Mike Fennel, New Zealand Governor General Sir Anand Satyanand, Monaco's Prince Albert II and Presidents Mohamed Nasheed of the Maldives and Marcus Stephen of Nauru. Hosts India are aiming to break into the traditional rivalry of champions Australia and England who have been fighting it out for top two slots in the past. The Aussies, who have topped the gold and total medal tallies at the past five Games and are expected to once again be confirmed as the number one nation, have sent their largest ever team to an off-shore multi-discipline sports event in a bid to continue their reign in Delhi. 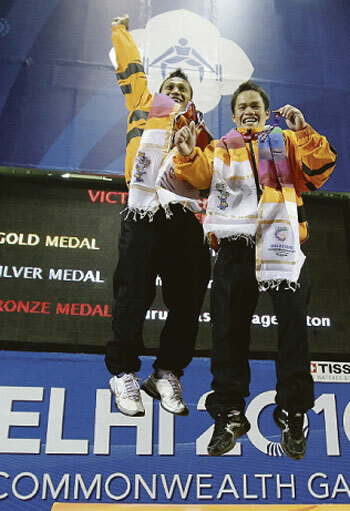 Although the country's high-water mark of 221 medals (84 gold, 69 silver and 68 bronze) at the 2006 Melbourne Games is unlikely to be surpassed in India, team officials expect another gold rush. Australia's record gold medal haul came at the 1994 Victoria Games in Canada with 87.